Essential simplicity and casual comfort combine in this modern bedding with an artisan vibe. The all cotton comforter and shams are a minimalist spaced stripe in black and ivory, softened by a broken twill weave that mingles the colors. A thicker black accent yarn is woven in to create the linear stripes, adding a subtle textural variation. A solid black ribbed cotton is used for the European shams and a decorative pillow, both embroidered with ivory folkloric-inspired patterns. Ivory cotton canvas accent pillows include an embroidered black plaid with black corner tassels and one with Ellen's signature script embroidery. The comforter and euro shams are gorgeous! We have a black, king sized bed and the colors look great. The backing of the comforter is not as soft as I would like. It reminds me of the backing on an old style bedspread. Other than that, very happy with the purchase. *Update: I didn't read before purchasing that this is DRY CLEAN ONLY. Wouldn't have purchased had I known. Also, of you have pets, this is not made for them to be on. We have a lot of pulls all over the comforter from our two small dogs being on the bed. Still loving the look of the bedding, but probably won't use it for long. Fabric is beautiful. Accent seams are attractive. Item is 100% cotton so has to ironed after shipping. Looks great on king size bed. The comforter is wide enough so it drapes over the sides of the bed. I would have given it 5 stars but one seam is sewn a little crooked. I love the soft feel of this comforter. I would definitely recommend a friend to purchase this item. The color is perfect in my guess bedroom. I just order the euro pillows and they blend in great with some black and gray pillows i already had. I'm very satisfied with this purchase. 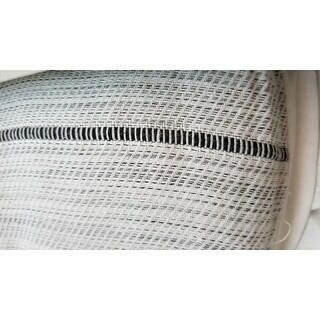 Very nice woven material seems like good quality. Larger than my old queen size comforter. 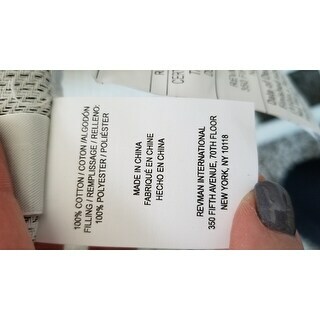 Beware the tags on the pieces in this set say dry clean only, NOT machine wash. The design and construction of this set more than meets my expectations and is as pictured. The problem I have is this, I bought this ASSUMING it was new and not used!! It arrived in a sealed bag, great first impression. After opening it I found the comforter had stains, pulls and random dog hair on it, this is not right! DO NOT send out something that you claim is NEW when in fact is used and a returned item!!! I'm not sure what to do now, I love the weave and tones but hate the fact someone else used it and stained it...UPDATE - I contacted Customer Service and they were very apologetic, immediately sent a new one out. They promised it would be inspected first. Got a call from Customer Care the morning it was delivered, it was nice to have someone reach out to me to make this right. The new one is in fact new, I’m thankful. I have raised my review from a 1 to a 3 for this. This comforter looks exactly like the phots. It matches my bedroom set perfectly. I love the simple stripes and color of the comforter. However, I only give it 4 stars because of the material. Even though the underpart of the blanket is soft, the top of it is not so much. It’s a little uncomfortable sometimes because it can be a little rough. I’m going to keep it because I like the design but I wish it was softer. Arrived quickly. I would recommend to a friend. The colors were exactly as purchased This is the exact look I wanted. Just the right thickness. Love it!! Looks great in person, good quality, king size fits my king mattress just fine. Very pleased!! This product is nothing like it says online. I ordered this because I wanted a machine washable piece and it states online that it is. when it arrived it said dry clean only. It is not soft at all. The material looks like it will snag super easy. It says online it is made in Pakistan but in fact it is not. Extremely disappointing. Called to have it returned and they wanted to just send me a new one. Very cool and organic looking! Have gotten many compliments on this comforter. "What pillows come in this set? 2 sham covers and the decorative pillow with Tassel?" This includes the comforter and the 2 shams. "Is this more in the greys?" I like white comforters, and this has modern but simplistic look I’m going for. "Is the king size a comforter or a duvet? 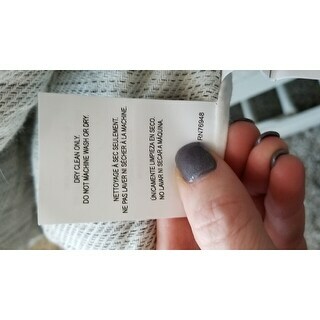 The top says comforter but the description says duvet." "The King sized comforter says the color is Ivory and the queen says Natural..I only see one picture..are these the same colors or different?" These are actually the same color. "Will this set be in stock again? " Sorry this item is discontinued and not longer available. "Do you sell all the other pieces in this set?"